Certain driving offenses in Texas can ensnare unwary drivers in a vicious cycle of fees, surcharges and license suspensions. The Texas Department of Public Safety’s Driver Responsibility Program imposes hefty surcharges on drivers who commit certain offenses or accumulate too many points on their driving records. Drivers who don’t pay these surcharges can end up with suspended drivers licenses. Notably, this TX surcharge is in addition to all other fines and reinstatement fees associated with the original violations. Program Specialists are available Monday – Thursday 8:00am-9:00pm, Friday 8:00am – 6:00pm and Saturday 8:00am – 12:00pm. Which Offenses are Subject to the Texas DPS Surcharge? There are two ways that drivers can incur a surcharge under the Texas program: through conviction of specific traffic offenses or through the accumulation of six points on their driving record. The convictions that can result in a Texas surcharge are driving while intoxicated (DWI); driving an uninsured vehicle; driving with an invalid license (one that has been suspended or revoked); and driving without a license (or with a license that has expired). In addition to drivers committing these offenses, drivers who incur six or more points on their driving records are assessed a surcharge every year they have six or more points on their records. For a first-time DWI violation, drivers are subject to a $1000 a year surcharge for three years. A second violation results in a $1,500 a year surcharge. If the DWI offense includes a blood alcohol concentration of 0.15 or high, the license surcharge is $2,000 per year for three years. Having no insurance can result in a $250 a year Texas DPS surcharge for three years. 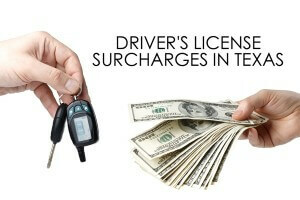 Texas surcharges must be paid within 105 days or DPS will suspend the driver’s license. The driver’s license will remain suspended until either the surcharges and related costs are paid in full or the driver establishes an installment agreement for payment of the surcharges. Drivers may pay the Texas surcharge online at www.txsurchargeonline.com, and they may also make arrangements to pay the surcharge through a monthly installment plan. Drivers should be aware though that missing a single payment under the installment plan can result in the suspension of their license. If the driver is unaware of the suspension and is caught driving, he or she could be convicted of driving without a valid license and be subject to another DPS surcharge for that violation. To pay surcharges in Texas, visit the DPS surcharge website at: www.txsurchargeonline.com. There are two programs available to help Texans of limited means meet their obligations under the TX surcharge program: the Indigence Program and the Incentive Program. Under the Driver Responsibility Surcharge Indigence Program, individuals living at or below 125% of the federal poverty level may be eligible to have the surcharges reduced to 10% of the total amount assessed, not to exceed $250. The Surcharge Incentive Program is available to eligible individuals with incomes above 125% of the federal poverty level but below 300% of the federal poverty level. Under the Texas Surcharge Incentive Program, the surcharge amount owed may be reduced by 50 percent. Under both the Surcharge Indigence and Surcharge Incentive programs, if individuals are making surcharge payments and do not have an additional enforcement action on their driving records, they may regain their driving privileges if they have been lost. Individuals can apply for these two relief programs from the Texas surcharges online. Additionally, drivers with suspended or revoked licenses as a result of their failure to pay surcharges may be eligible to apply for an occupational license for purposes of getting to work or school. Since the DPS program was enacted in 2003, it has received much criticism. More than 1.2 million Texas drivers have been stripped of their licenses under the program, unable or unwilling to pay the billions they owe the state in surcharges. The vast majority of these drivers are probably driving on their suspended licenses. The program is understandably unpopular in Texas, and various groups have called for its repeal. However, attempts to repeal or modify the program have been unsuccessful in the state legislature because the program is a significant source of revenue for the state. Legislation that would ease the penalties under the program passed the Texas Senate last year, but has not been made law. If you are unsure whether you have a pending TX DPS surcharge or if you would like to pay your Texas DPS surcharge, you can do this online at www.txsurchargeonline.com. Surcharges in Texas are frustrating and sometimes confusing. If you need clarification on your TX surcharge, you should contact the Texas Department of Public Safety by phone or on their website at www txsurchargeonline com.